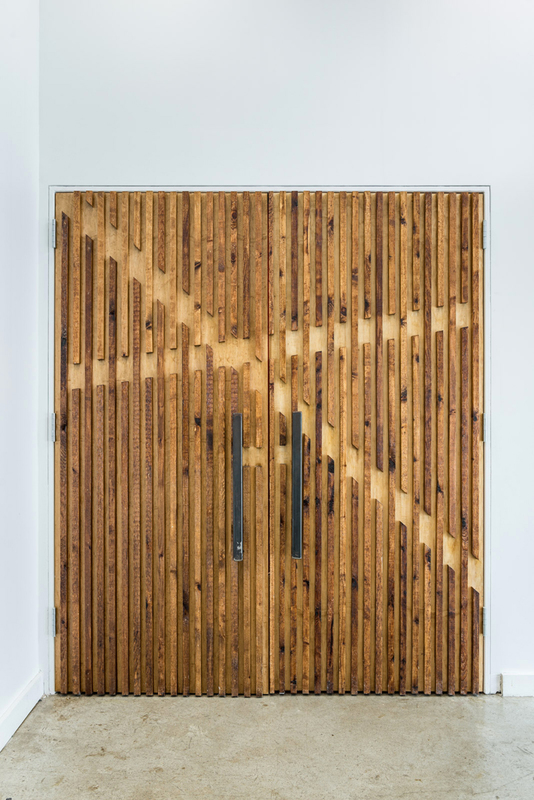 Cedar plank cladding in the main venue provides acoustic control and gives the interior an elemental simplicity. Photo by Julian Bajsel. The architects designed the sign that wraps the building’s corner. Photo by Peter Molick. The building houses two venues, which are expressed in the massing as seen from North Main. A gradient gray stripe was painted at the base of the elevation to give the White Oak an identity that wasn’t just a “cheesy sign.” Photo by Peter Molick. The roof deck provides a perch to watch an outdoor concert or take in the view of the downtown skyline. Photo by Peter Molick. Cedar plank siding on the back elevation is laid over rock wool insulation, dampening sound reflected off the building during outdoor concerts. The windows open onto the small venue’s stage. Photo by Peter Molick. The architects added shocks of color in certain circulation spaces. Photo by Peter Molick. One of three bars in the main building. This one, on the mezzanine, is lined with concrete panels. Photo by Peter Molick. The architects designed the doors that open onto the venues. Photo by Peter Molick. The smaller venue, with its window behind the stage, looking out on Houston. Photo by Julian Bajsel. The Raven Tower and Lounge, another venue on the site, housed in a reclaimed fabrication shop. Photo by Peter Molick. 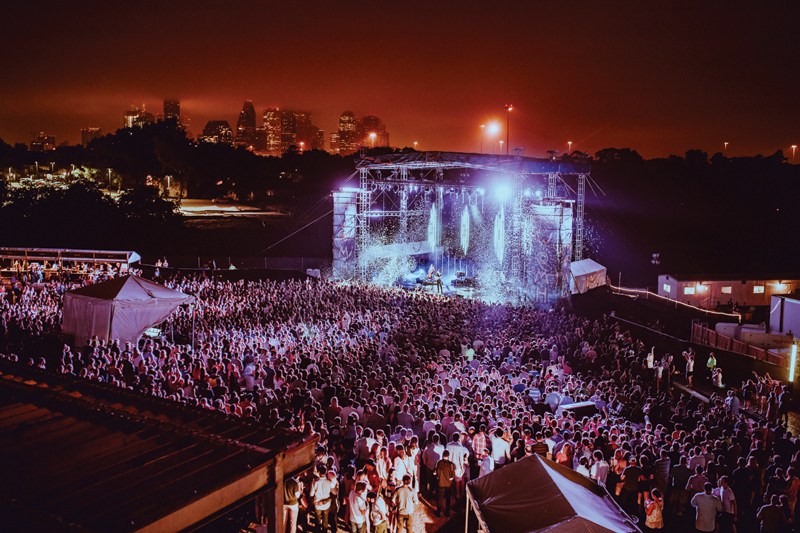 The outdoor venue has room for 3,500 people, and a great view of downtown. Some neighborhood residents want to shut it down, permanently. Photo by Julian Bajsel. Houston’s Near Northside is on the verge of a development boom. Property prices in the primarily Latino, working-class residential district have doubled in recent years, buoyed by the neighborhood’s proximity to downtown and the recent completion of METRORail’s Red Line expansion, which brought the light rail to North Main Street. 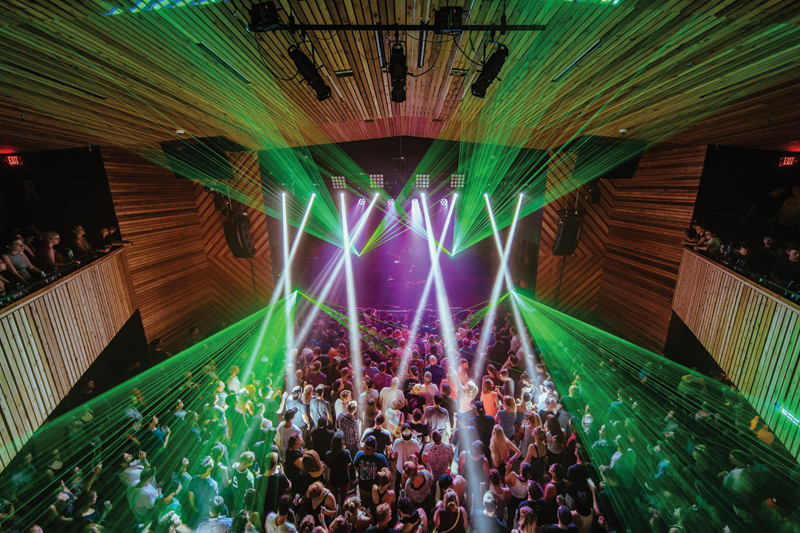 As longtime residents brace for more change, one harbinger of what’s to come has already risen in their midst: White Oak Music Hall. 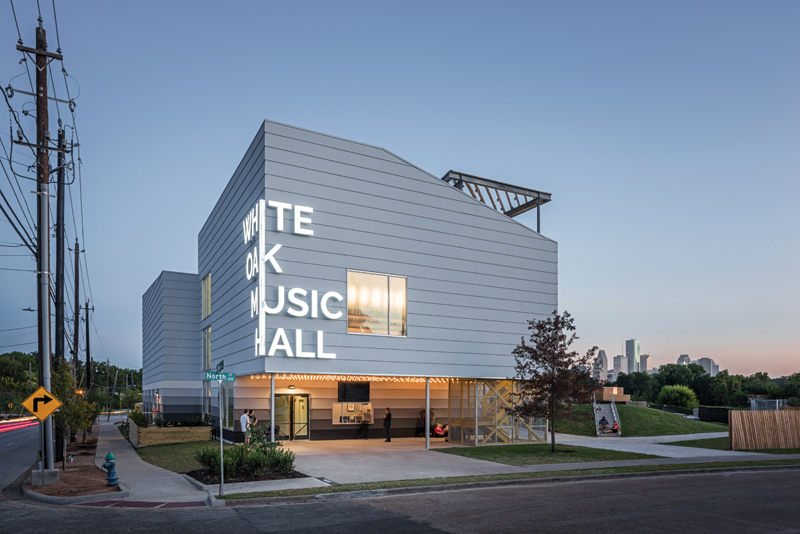 Sited above the floodplain of the Little White Oak Bayou (the project’s namesake), at the corner of North and North Main, the music hall is one of those only-in-Houston projects that leave people from other cities scratching their heads. First of all, it’s a ground-up rock club. Such venues are usually inserted into existing structures — old movie houses, ballrooms, warehouses — places that already possess the gritty patina of time, which is essential to that elusive quality, “authenticity.” To conceive and construct a newly minted version of the type seems perfectly in character for the city that built the Astrodome. The five-acre site was assembled mostly from empty and abandoned lots. The only structures to be preserved and incorporated into the new venue included the former fabrication shop of R.W. 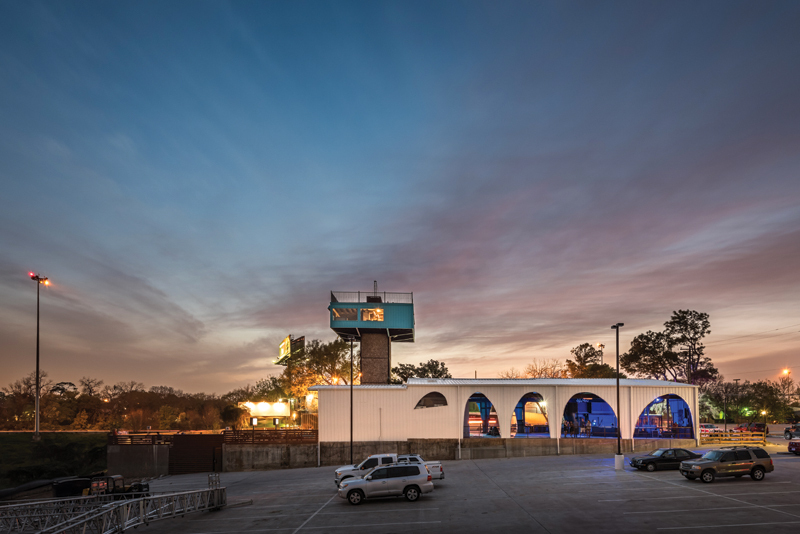 Walker’s Metal Enterprises and its attached Raven Tower — Walker’s “bachelor pad in the sky” — a Houston landmark since it was completed in the 1970s. The team worked with the City of Houston to get a 380 Agreement — a state-sponsored economic development tool that allows cities to reimburse developers for public infrastructure improvements, using funds from the increased tax base the project generates. This helped cover the cost of putting in new streets, sidewalks, and a sewer system, not to mention 650 parking spaces. 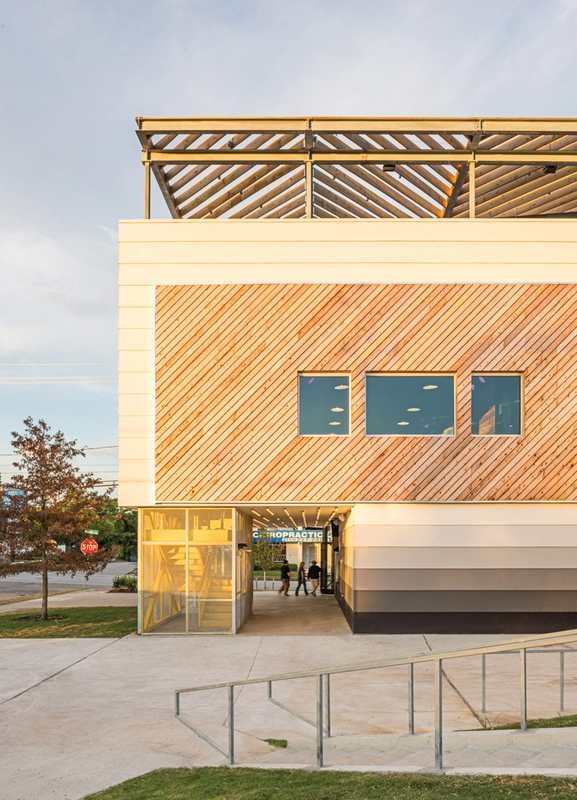 The steel structure is clad in Hardie Board — the cheapest way to build in Houston, according to Schaum. The architects ripped the Hardie Board down the middle and laid it up the elevation like lap siding, setting up a 1-ft, 10-in dimension that became the module for the design. The Hardie Board is painted in a black-to-gray gradient at the base of the building, “to create a graphic identity that’s not a cheesy sign,” Schaum says. The architects did, however, also design a bold and graphic sign that wraps the main public corner. 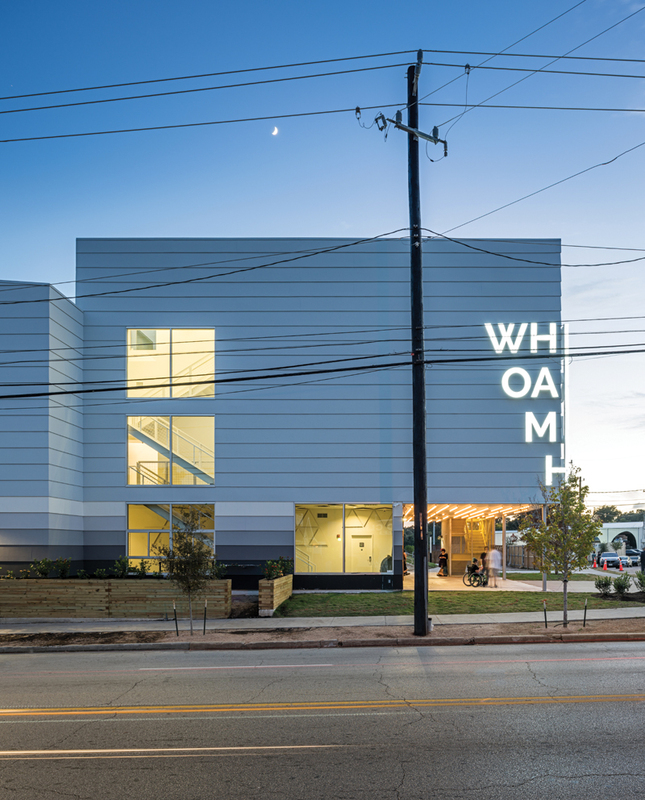 Lit up with white light at night, spelling out “WHITE OAK MUSIC HALL,” it acts as a beacon on what is otherwise currently a quiet and dark stretch of North Main. The rear of the building faces an outdoor stage with a capacity of 3,500. Two decks on the second level and a third on the roof (that was added during construction) provide perches for taking in a show or viewing the downtown skyline. 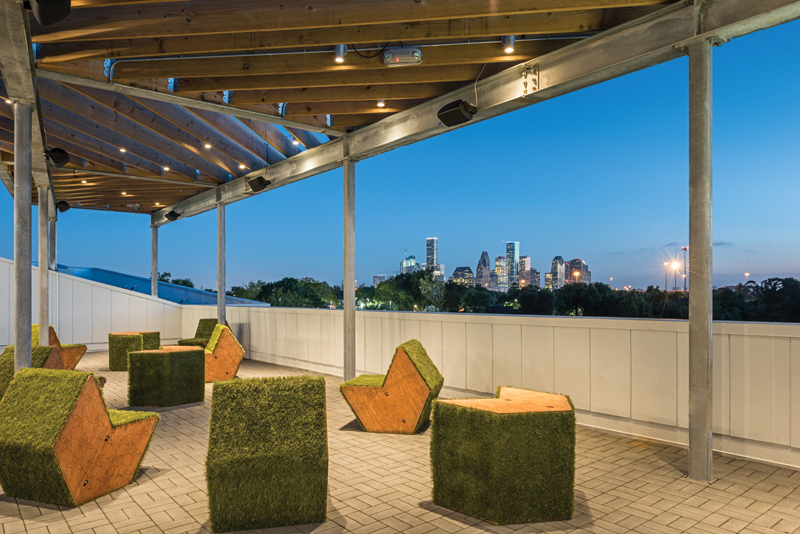 The decks are topped by timber brise-soleil, as opposed to roofs, leaving inhabitants exposed to Houston’s frequent rain showers. 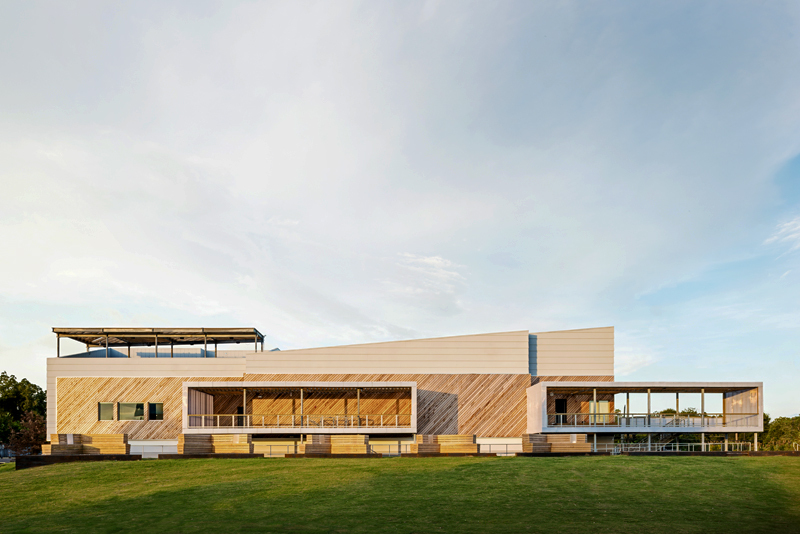 Angled cedar-plank siding is laid over rock wool insulation, dampening the sound reflected off the building during outdoor concerts. Raised weathered-steel boxes, platforms for wood box seating, ring the ridge of the grass amphitheater, which slopes down to the stage. The layout of the large indoor venue is based on Fitzgerald’s. It’s a flat shoebox shape, which puts everyone in the crowd close to the stage. The oversized proscenium also gives the impression that you’re very close to the band. Angled cedar planks line the walls, spaced 1/2-in to 1-1/2-in apart with rock wool insulation behind. 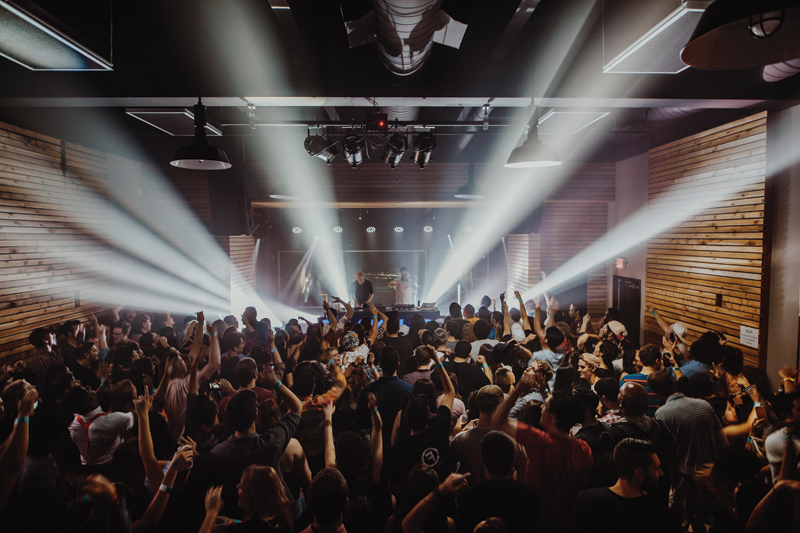 The architects worked with JaffeHolden on the acoustical design and with Tim Nowicke and Generations AV on the production design. 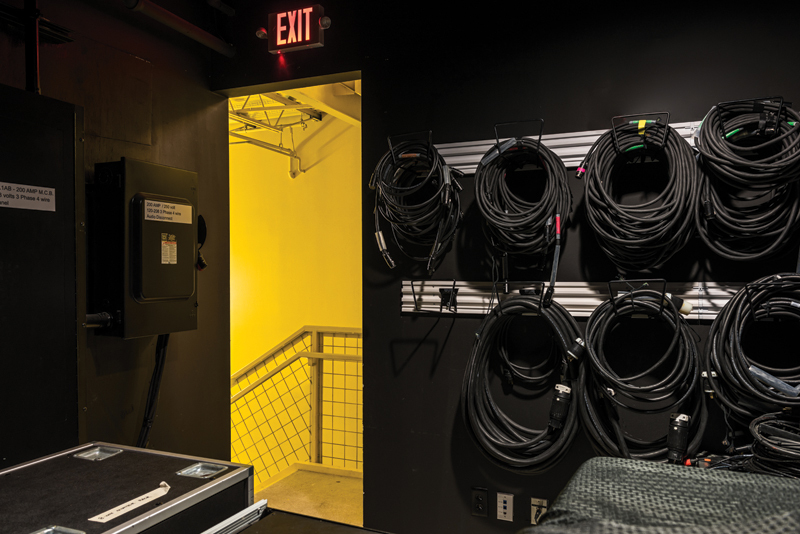 The smaller indoor venue features a window behind the stage that looks out on the skyline. There are three bars — one serving the small stage, two the large, each punched into recesses, and each expressing a different elemental materiality: wood, stainless steel, concrete. 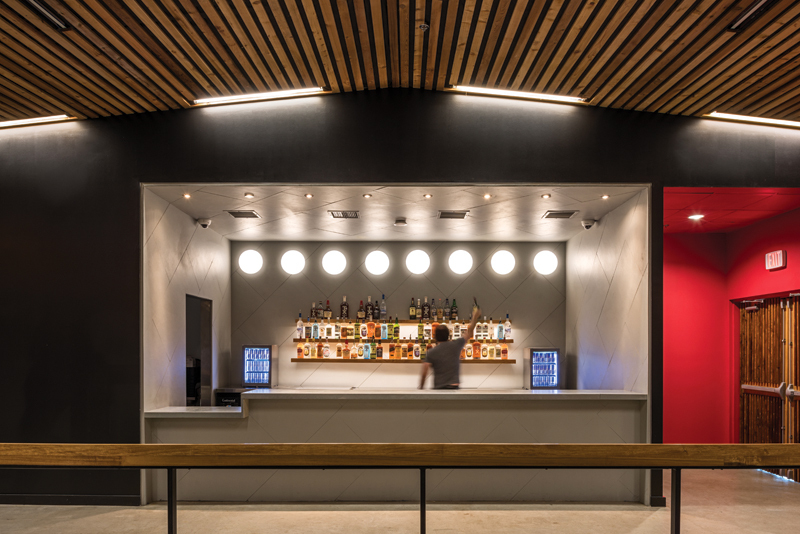 The architects worked with Gin Braverman of ginsdesigngroup on some of the interior spaces, including the artist green rooms, which are well-appointed and include facilities for laundry and showering — rare and valued amenities for touring musicians. R.W. Walker’s old fabrication shop was turned into a separate venue. The architects sketched arched holes cut out of the metal building’s siding to create an open-air pavilion. A bar and outdoor patio space — a place to bring your dog on Sunday and watch a football game — face the bayou. The Raven Tower was turned into a lounge (also finished by ginsdesigngroup), and the architects are currently working to add a fire stair to the space, to update the certificate of occupancy so it can be opened to the public.